Work to restore a further length of the Cotswold Canals near Stroud town centre will begin next month, Stroud District Council has announced. The council has awarded a £390,000 contract to Alun Griffiths Ltd to dredge and widen 120m of the Thames & Severn canal above Wallbridge Lower Lock. 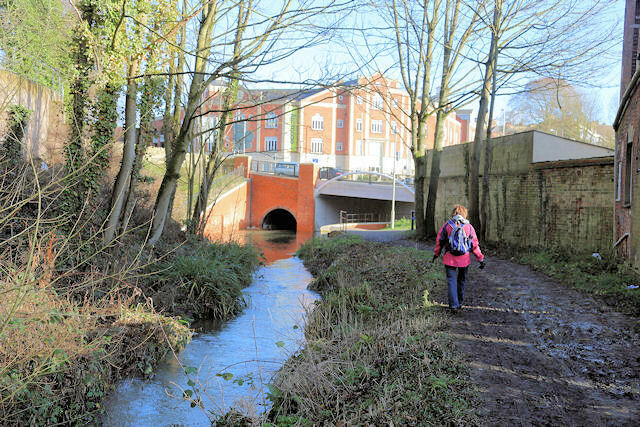 The contract includes construction of a bypass channel, beneath the towpath, to carry the flow of Slad Brook around the lock. The channel’s design allows fish and eels to easily migrate upstream – which they cannot do at present. Griffiths expect to begin setting up their site on 9th June. The Abergavenny based company is well-versed with the canal project, having restored Ryeford Double Locks and built 330m of new canal at Capel’s Mill. Stroud District Council has also awarded a £110,000 contract to Land & Water Services for the dredging of 4,500 tonnes of material from the canal below Wallbridge Lower Lock. The company expects to begin work here during July. Wallbridge Lower Lock, the first lock on the Thames & Severn Canal, fell into disuse in the 1930s. A third contract, let to Cheltenham based Britannia Construction, will see the lock itself restored early in 2015, once the other work has been completed. Click here to read more about that grant. Ian Edwards, the council’s Canal Manager, said “Technically, this is a challenging site in which to work. Access is very difficult and would have been impossible without the kind assistance of landowners.